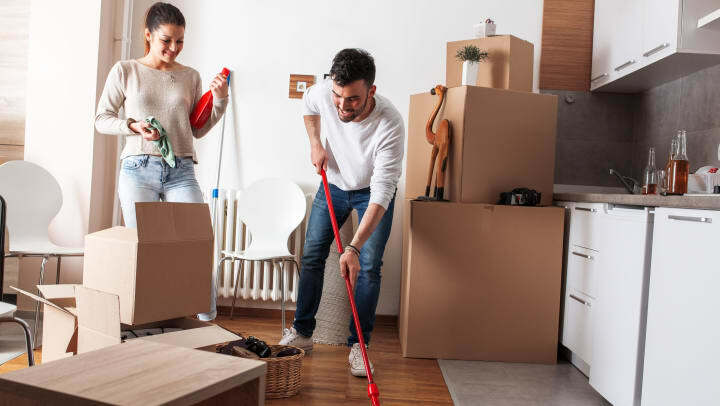 The last thing you want to do when you’re done moving into a new place is clean your old place, but it’s a necessary evil if you want to get most or all of your security deposit back. It doesn’t have to be a big chore, especially if you’ve done a good job of maintaining basic cleanliness while you lived there. A little organization – and a lot of elbow grease – can go a long way toward getting your full security deposit back. The internet is full of move-out cleaning checklists, some more thorough than others. Find one you like, download it, and actually use it! It will be a great reminder to clean the shelves in your closet or other places you wouldn’t think would need cleaning, especially after a full day (or two!) of moving. Before you start cleaning, make sure you have all the tools, cleaners, and other supplies you’re going to need to get the job done. This should include an all-purpose cleaner, window cleaner, rags, a broom and dustpan, paper towels, rubber gloves, and a mop or vacuum. The best place to start your cleaning marathon is in the bedrooms. For one thing, most bedrooms are just four walls and a floor, so there aren’t a bunch of nooks and crannies you have to spend time cleaning with a toothbrush. Finishing off the bedrooms is an easy way to kickstart your motivation and get you ready to tackle the rest of the house or apartment. It can be easy to overlook your ceilings when you’re trying to clean the rest of your place, but ceiling fans are notorious for collecting staggering amounts of dust. Make sure to give them a good wipe down, and get any cobwebs out of the corners. Open up all your cupboards, drawers, closets, even your fridge, and give all the interiors a good cleaning. Having a sparkling refrigerator will go a long way toward getting all of your security deposit back. The dirtiest parts of your home need the most attention during the move-out clean: the kitchen and bathrooms. Plan to spend a lot of quality time in these rooms, and bring your strongest cleaning supplies. Make sure to pay special attention to hard-to-reach areas, like where the walls meet the countertops, or behind the fridge. There’s no shortcut to getting your full deposit back. It requires time, patience, and some work on your part, but it is possible. If one big cleaning day sounds too daunting, try breaking up your tasks into chunks you can accomplish every day. Then when moving day comes around, all you have to worry about is settling into your new home.